We are now in the final stages of a journey that will be seen by future historians to be as unreal as Lewis Carroll’s Alice in Wonderland. Just as Alice called the Mad Tea Party the stupidest tea party she had ever been to, the last 100 years could be called the Craziest Extravaganza in history. Although the story was written 150 years ago, had Alice dropped down the rabbit hole to the current fantasy world, she would have called the current kings and queens (government heads and central bankers) a giant house of cards. Because we are now at the end of a tea party that, in the last few decades, has become increasingly extravagant. 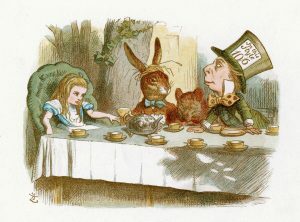 Von Greyerz discusses who’s picking up the tab for history’s biggest tea party; the most ingenious invention in the history of finance; the second-most ingenious invention in the history of finance; and Alice in Horrorland. But there can still be peace for those who protect themselves with physical gold and silver. Gold is the only money which has survived for 5,000 years and is therefore the ultimate wealth preservation asset. Physical gold is scarce and cannot be manufactured or printed; gold is eternal—all the gold ever produced still exists; gold has no counterparty risk and is not someone else’s liability; gold is instant liquidity; gold has served as money/barter in every period of distress in history. If you understand risk and you understand history, you must hold gold. Are Rising Interest Rates Bad for Gold?